I met Nicky Jeanette when he was 10 years old. His mother Kathy was a co-worker turned friend who managed an infectious laugh even on the most stressful of days. Blue-eyed, freckle-faced, fair-haired and absolutely adorable—Nicky was the center of his mother’s world. 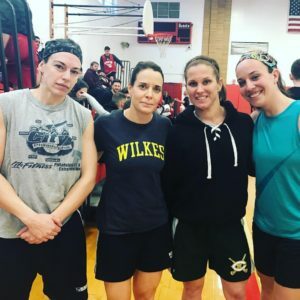 Today Nicky’s adoring mother told a packed gym at Haddon Township High School about her son’s love for sports and his passion for helping others battling addiction. She told us about the basketball court his Dad poured in their backyard and the hours he spent teaching Nicky to shoot. She concluded her remarks by tearfully trying to describe life without her precious son. As I was fighting back tears, I turned to my own precious child who could not stop the ones flowing down his face. Haunted by demons that have threatened the very worst, Jack heard first hand what it felt like for a mother to lose a child, a concept I have often tried to describe, and he never understood. The only people who truly understand are the victims to the unthinkable. The enormity of her grief moved my boy to tears. In the horrible reality of Kathy’s sorrow, Jack “got it.” Nicky Jeannette indirectly helped yet another person—my boy—a more than a year after his tragic death. 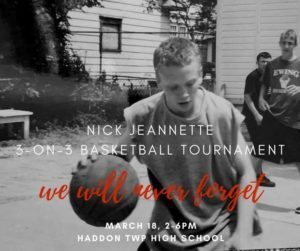 The First Annual Nick Jeannette Memorial Tournament was a huge success. Teams of people poured in the gym to both honor Nicky’s memory and play a game they loved. I could tell from the size and skill of the players, many had high school and college careers. This chance to play in an organized fashion had the athletes very excited. Seven of those athletes belong to me. Eight if you count Jack, and you have to because he sat on the bench with both of our teams cheering and dancing for every basket. A damn good baller in his own right, he begged me to play for weeks leading up to the event and understood why I said no once he walked into the gym. Many of these boys were BIG. The only all-girl team seemed small at first glance, but the gun show said otherwise when the hoodies were peeled off. Someone in the crowd exclaimed, “those girls are jacked!” They were the 1Forcers aka Nasty Girls. I planned on naming the teams 1Force and 2Force, but as I was typing the registration email to Kathy, I had a nasty idea. “I can’t wait to see these Nasty Girls,” Kathy responded. And see them she did. Even though their first game was their last, they gave an epic fight that was noticed by all. Led by Jaime Land, former All-American stand out at Rowan University, our “nasties” came out hard, shocking both the crowd and their huge opponents. Eventually our opponents figured out our game, and double teamed Jaime while sending their big guy to the three-point line to sink consecutive baskets and beat us by a 6-point margin. But that didn’t matter a damn bit to me. Watching Ashley Cornell ball like a dude, Kristin Goldberg dribble like a pro and Sheri Walsh body check like it was her job was pure March Madness. These ladies are my final four. Jesse’s fit team won their first game by the slimmest of margins. One point. They didn’t out skill their opponents, but they did out play them. Jesse played with Chris Straga and Antwine Perez, and they were equally as nasty as my girls. Straga has behind the back moves and three pointers for days. Who knew? Twine looked downright SWOLE as he tried not to tackle anyone—and I get it he’s a football guy—with a pretty sweet jumper and the finesse of someone much smaller. Soft spoken by nature, nothing about Twine’s game is quiet. I think I lost my voice by the end of their second game, where the boy 1Forcers faced a young super star shooter and lost by two. I’d be remiss if I didn’t mention my super star who often tells stories of glory days. 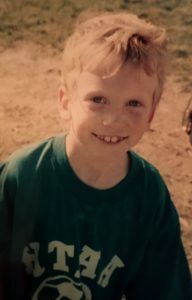 Jesse didn’t start playing basketball until he was 12. Most players start in kindergarten rec leagues followed by skill camps, coaches and clinics. Given his experience and stature, I often wondered how good Jesse really was in high school. I wonder no more. Kelly and I were beaming and screaming with pride as Fit Papi showed off his extremely well-rounded game. My man has a jumper, spin move, pump fake and plays D like he Deadlifts. Aggressive AF. Reflecting on my day from a North Jersey hotel room as I listen to the sweet sounds of my daughter sleep the night before her gymnastics meet—I know I am blessed. I barreled up 95 after Nicky’s memorial tourney to prepare for her 7:30am report time. I vow to never take one minute with her for granted. My dear friend Kathy concluded her opening remarks with a chilling, “I hope none of you ever have to bury a child.” The mere thought is too shattering to even entertain. Blue-eyed, freckle-faced, fair-haired and absolutely adorable—this nasty girl I lay next to sits at the center of my world with her three knucklehead brothers. She’s the same age and size Nicky was the day I met him and has a similar innocent toothy smile. That’s how I will remember my friend’s little boy. The disease of addiction is robbing multiple generations of loved ones, sons and daughters alike. No one is safe. We must work together to raise awareness and acceptance for those who have overcome and support them in their continued sobriety. None of us is without demon. The Jeannette’s are bravely living their new normal while somehow finding the energy to fight the disease that took their son. Breaking down the stereotypes of addiction, mental illness and depression and sharing painful experience will truly make a difference. Directly or indirectly—your action and support could even save a life.